Geneva, Switzerland, 17th September 2013. – In recognition of his outstanding creativity, innovation and productivity in recent fluorine chemistry research, Prof. Dr. Sebastian Riedl of the Berlin Institute for Chemistry and Biochemistry has received the very first International Young Talent Award in Fluorine Chemistry from DuPont Chemicals & Fluoroproducts (DC&F) at the occasion of the recent 17th European Symposium on Fluorine Chemistry in Paris. 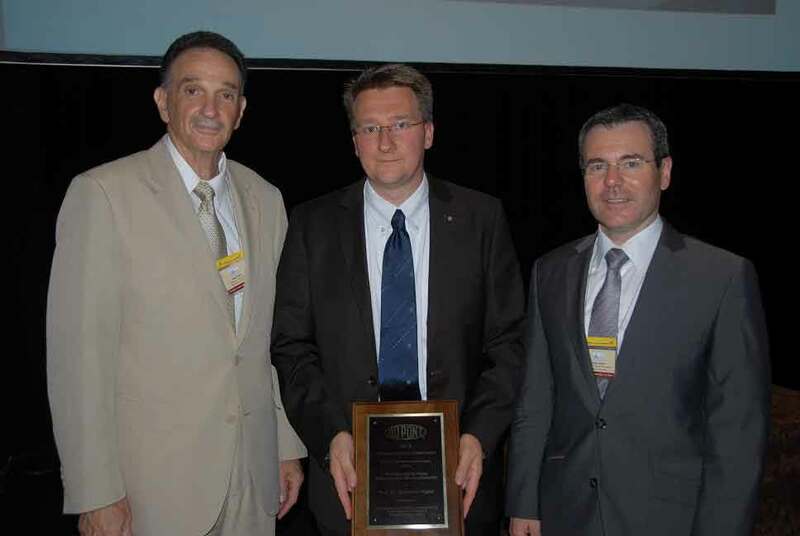 Martial Pabon, R&D Manager, DuPont Chemicals and Fluoroproducts EMEA, and Mario Nappa, Fellow, DuPont Chemicals and Fluoroproducts, presented the award to Prof. Dr. Riedl on 23rd July 2013 at the European Symposium, which was held in Paris from July 21st to July 25th 2013. The awards ceremony took place in the ‘Maison de la Chimie’ in Paris witnessed by an audience of more than 300 delegates. The presentation of the award coincided with the 75th Anniversary (2013) of the discovery of PTFE by DuPont scientist Dr. Roy Plunkett in 1938. The criteria used in the selection process for the award were creativity, innovation and productivity in recent research publications and presentations. Prof. Dr. Riedl received the award, which included an endowment of 1000 euros, in recognition of his research of high-valent novel inorganic compounds using a combination of experimental fluorine chemistry, matrix-isolation spectroscopy, and quantum calculations. These compounds are produced at low temperature on the border of stability and therefore provide a fundamental contribution to the understanding of chemical bonding.